As the year ends, it’s a natural time to look back on the past 12 months and see how we’ve changed while glancing ahead to the new year with excitement about what’s to come. This year brought changes to WRAP and new products, too. Advocates for Human Potential, Inc., (AHP) created Human Potential Press as the publishing arm of the company. HPP is responsible for the publication, management, and distribution of AHP materials, as well as all WRAP and Recovery Books materials. Following the publication of the new Red Book, we released a revised edition of WRAP for Veterans. The new book, Wellness Recovery Action Plan for Veterans, Active Service Members, and Military in Transition, includes real-life stories from Veterans and active military personnel in every chapter. Robert Leavy, a U.S. Army Veteran and advanced-level WRAP facilitator wrote the foreword. The new introduction includes important framing information about how Veterans and people on active duty in the military can use WRAP. There’s also an appendix with additional resources for Veterans. This updated edition is nearly twice the size of the original edition and is available at the same price. 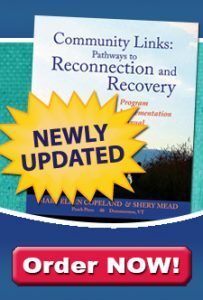 The Wellness Recovery Action Plan Workbook has also been updated. This companion piece matches the new editions of the WRAP books. This new version includes prompts to help you bring WRAP’s five key concepts into your daily life, tools to help you set goals in every area of your life, and broader prompts in the crisis plan section to help you create a WRAP for any area of your life and wellness. The new “My Wellness My Way” section is a valuable tool to help you think about where you currently are, where you want to be in the future, and how you want to get there. There’s also an employment planning section. The pocket-size WRAP on the Go and Crisis Plan on the Go replace My WRAP and My WRAP Crisis Plan. Like the other updated products, these match the new editions of the WRAP books in terms of their design and refreshed content. WRAP is working with American Prison Data Systems (APDS) and has created a curriculum for APDS’ elearner tablets used in prisons and jails. Wellness Recovery Action Plan for Reentry: Moving Forward from Incarceration and WRAP for Addictions are both offered on the APDS tablet. We’re looking forward to 2019 and introducing even more new and updated products to you. Wellness Recovery Action Plan for Reentry: Moving Forward from Incarceration is going to be released as a book, as well as an updated version of WRAP for Addictions. Both are scheduled to be released during for the first quarter of the year. Wellness Recovery Action Plan, the WRAP Workbook, WRAP and the Go, and Crisis Plan on the Go will be made available in Spanish. Providing a Spanish version of the WRAP Workbook is brand new, and we are excited to make this resource available to WRAP users. The WRAP app has been updated to match the new WRAP products and will be ready early in the new year. The big news for 2019 is that we will be updating the WRAP Facilitator Training Manual, as well. Stay tuned for updates on this as it moves forward. If you are interested in receiving email updates when the new products are about to be released or have any questions (or ideas to share), please send me an email at mjaffe@ahpnet.com. I’ve enjoyed learning about WRAP this year, as well as taking part in an online WRAP group (WRAP Seminar I: Developing Your Wellness Recovery Action Plan). It’s great to talk with so many people whose lives have been changed by WRAP. Happy holidays to you, and I wish you a very happy and healthy 2019!